Summer has finally come, but nothing is going as Jack had planned. His vacation freedom is quickly lost when he is grounded “grounded for life” for accidentally discharging the rifle his father brought home as a souvenir of WWII. The blast from the gun caused his elderly neighbor to drop her hearing aid into the toilet and so the only thing he will be allowed to do is to help her. At first helping Miss Volker seems like torture – after all he has to be there at 5:30 am -, but he quickly realizes it might be the only way he will survive the summer. Miss Volker cannot write because of her arthritic hands, but she is the author of the town’s obituaries and the keeper of the town’s history and someone must tell the story. Jack becomes her scribe. He doesn’t think there’ll be much to do, but soon it becomes apparent that all is not as it should be. Not only are the original residents dying off at an alarming rate, but the town of Norvelt itself, may be nearing its end. History, obituaries, nose-bleeds, Hell’s Angels, Eleanor Roosevelt, Girl Scout cookies and a homemade airplane combine to create a laugh-out-loud story that will make you think and wonder. It has a serious side too. How do promises get made and twisted? What is the importance of history and how do we know and understand it? How do communities work? Can you every really be alone and disconnected? Jack Gantos has combined truth and fiction to present you with an interesting view of small town life in the early 1960’s – an time of change. 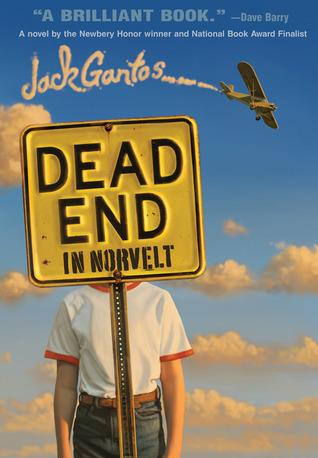 It is interesting to me to come to the end of Dead End in Norvelt and realize that my life has now become historical fiction. All three of the books selected by the Newbery committee this year are set in the time when communism was on our mind as the evil opposite of democracy. It has been interesting for me to read and wonder at how that mystique was created and to wonder what is being created now. Vietnam was the war of my youth. Afghanistan is the war now. What things change, and what things stay the same?